As an independent artist who feels a strong calling to encourage others, I’ve experienced all manner of setbacks and discouragements along the way. For years I’ve been using Social Media to share advice and experiences. The time came where I’d compiled enough daily insights and scripture to write a devotional! And I’m so pleased with the outcome. This book is for anyone who wants to fulfil their potential and realise their true identity and value in God. If you’ve struggled to overcome criticism, failure or low self-esteem this devotional is packed full of God’s truth to keep you on purpose. What was the hardest part about writing Amazing You? What did you enjoy the most? Throughout 2018 I uploaded to YouTube every single day. Maintaining that schedule alongside touring and finishing the book was a little crazy! But the book is more than I ever dreamed it could be. I truly can’t wait to share it. What was the most surprising thing that you learned on the journey to creating your book? It amazes me how deeply scripture takes root in us. When we meditate on God’s truth it becomes a part of who we are, a powerful weapon we can unleash upon the numerous discouragements, distractions of deceptions we face in life. We really can’t get enough scripture! You are perhaps best known for your singing and song writing – how does writing devotionals differ from writing songs? Honestly, it feels the same to me. The two things just occupy slightly different places in our worlds. The written word reaches us on a unique level and so does the sung word. But it is the truth within each that makes the change. Do you view your writing as a spiritual practice? I feel that when we write with God as our focus He can really use what we write. Whether just sharing a status on Facebook or publishing poetry, God can touch people through the words we draw from our time and relationship with Him. It is amazing, and it’s available to all of us! The subtitle of this book is 365 devotions for dreamers - Why are you so passionate about people achieving their dreams? I really believe that dreamers change the world! We all have dreams. It doesn’t matter whether we dream of changing laws or raising a family, when we align those dreams with God’s heart we can affect amazing change in the world around us. What piece of advice would you give to someone who currently feels discouraged or feels like giving up on their dream? I know how they feel. But the truth is, we have to flex our own spiritual muscles and seek encouragement. We have to learn how to tune out the many ‘no’s we hear and focus on God’s ‘yes’ in our lives. It’s important to be intentional about the advice we take, the messages we absorb and the way we spend our time. God hasn’t put any desire in you that can’t be achieved! 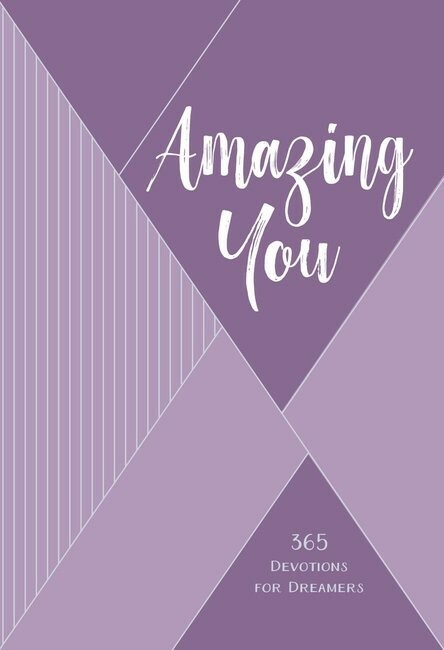 How is Amazing You different to other devotionals? Like most, the devotional contains a daily scripture, prayer, reading and reflection. But I’ve designed the book in a unique way. You can read it as a daily devotional, let it fall open and read at random, or you can search topics via the contents page. I’ve grouped specific readings by month. So if you want to read about a specific topic, failure, low self-esteem, bullying, staying motivated for example, you can go directly to the pages that will inspire you most! What do you hope readers will get most out of reading Amazing You? I hope that by reading and absorbing this series of truths they will end this year a more confident, inspired and empowered believer than ever before! I can’t wait to hear testimonies of lives changed and dreams achieved.